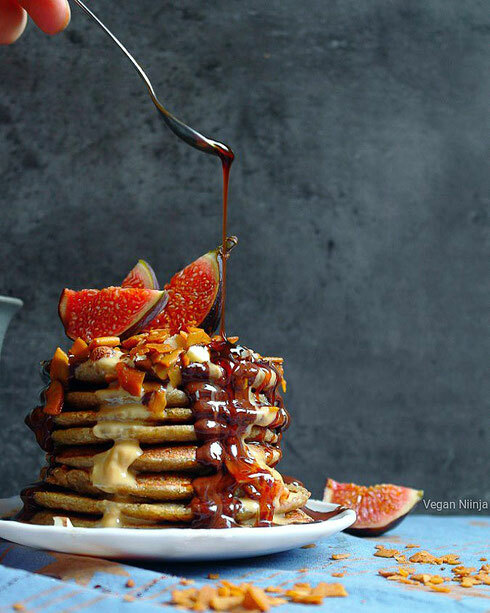 Cardamom-Oatmeal Pancakes - simply & healthy vegan recipes that taste amazing! Pound the cardamon seeds into a fine powder with a pestle in a mortar. Add all the ingredients except the baking powder and apple vinegar in a blender and blend for about 2 minute. The batter should be very well combined and smooth. Add the baking powder and apple vinegar in a separate bowl and let them react with each other for some minutes. Add the mixture to the batter and mix it together. Heat a non stick pan on a medium heat or an iron pan on low heat (add some coconut oil for the first pancakes, for the others you will not need any oil), and add 1-2 tbsp of the batter to the pan and cook until you can see small bubbles on the surface, swipe to the other side and cook until light golden. Serve with melted chocolate, peanut butter, coconut blossom syrup or whatever you like! Die Kardamom Samen im Mörser zerreiben. Alle Zutaten (außer das Backpulver und Apfel Essig) in einem Mixer geben und mixen bis die Konsistenz geschmeidig und fein ist. Währenddessen das Backpulver und Apfel Essig separat in einem Schüssel mischen und reagieren lassen. Nach ein paar Minuten die Mischung zu dem Teig geben und nochmals kurz mixen bis alles gut verrührt ist. Eine Pfanne auf mittlere Temperatur erhitzen und 1-2 EL Teig für einen Pancake darauf geben. Umdrehen wenn du kleine Luftbläschen auf die Oberfläche siehst. Mit geschmolzenen Schokolade,Erdnuss Butter und Kokosblüten Sirup (oder Obst und Beeren) genießen! Leave a comment below - let me know what you think about my pancake recipe or give me some feedback if you try it you! I tried the Recipe, it made well formed pancakes, they are quite savoury and the cardamom is interesting but I found some pancakes had too much cardamom and some none at all! Thank you for your feedback! Yes for more sweetness I would add dates or coconut sugar. I am happy you have tried them out! For the cardamom I dont know why you didn't get them for the pancakes, did you blend the batter until smooth?